On average, the participating truckload carriers experienced a breakdown every 9,136 miles during the first quarter. The top-performing best-in-class fleets reported a breakdown every 33,809 miles, while the lowest performer had a breakdown every 8,085 miles. 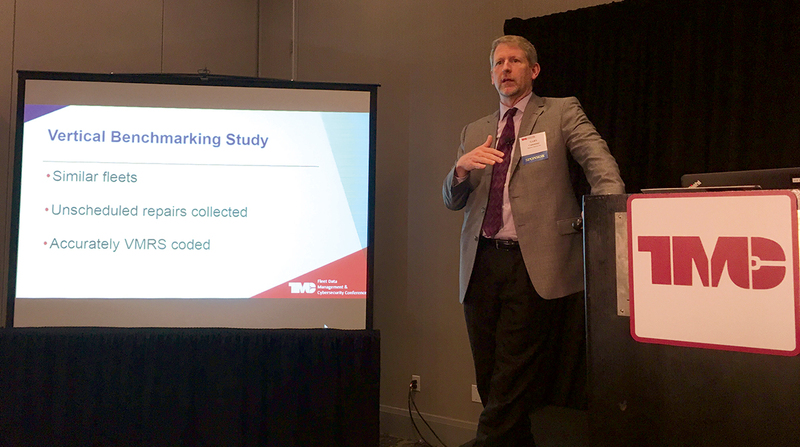 The study was released June 6 at the TMC Fleet Data Management & Cybersecurity Conference here. The benchmarking program is an ongoing study that began in the fourth quarter of 2017. Two full quarters of data are now available, with second quarter 2018 data on tap to be added to the database. Participating fleets are asked to provide all their roadside repair data by using the Vehicle Maintenance Reporting Standard coding system. Fleets that participate receive an executive summary of the study results every quarter along with an analytic tool that allows them to drill into their own data and compare it to the industry average. The analytics provided via the program will be cumulative and nonfleet specific. Maintenance costs for fleets rose 20% from 2012 to 2016 and account for 18% of total vehicle-based costs, FleetNet CEO Gary Cummings said. Further, a roadside repair can cost as much as four times more than a shop repair. In the first quarter, the top five VMRS categories accounted for 58% of all repairs, compared with 37% of all repairs in the fourth quarter of 2017. Those categories are tires, lighting, brakes, exhaust systems and wheels/rims/hubs/bearings. The two leading areas for repairs during the first two quarters of the study were exhaust systems and wheels/rims/hubs/bearings. In the fourth quarter of 2017, exhaust systems led the list of most frequent repair category with 235,026, but that dropped significantly to 139,220 in the first quarter. Wheels/rims/hubs/bearings saw 170,212 repairs in the fourth quarter rise to 190,723 in the first quarter. Tires saw a failure every 32,733 miles, down slightly from 32,166 in the fourth quarter. The best-in-class fleets recorded a 45% lower repair rate than the industry average when it came to tires. Lighting failures were the second leading cause of repairs in both quarters for participating fleets. However the best-in-class fleets reported an unscheduled lighting repair rate nearly 10 times better than other fleets. The average fleet needed a lighting repair every 43,789 miles while the best-in-class fleets saw a repair every 411,344 miles. The program is a strategic collaboration between TMC/ATA and FleetNet America and is open to TMC fleet executive level members and FleetNet America customers. VMRS is a licensed coding system that covers trucks, tractors, trailers and other equipment. It is used by original equipment manufacturers, suppliers and fleets to simplify maintenance through the use of alphanumeric, industry-standard codes that help describe maintenance functions.